An Air Traffic Controller by trade. 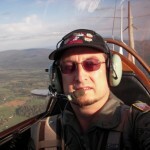 Aircraft owner (My Dad and I have a Cessna 170, an Acrosport II, a Pitts S1S, and the J-3 Cub in which he taught me to fly. I have WAY too many kits collected (about 1300) and too little time to build! I build mostly aircraft, any scale, era, country, and or type is fair game!